Buninyong is a township on the Midland Highway 11 km south of Ballarat. The name arose from Mount Buninyong (originally Boninyong), which overlooks the town 4 km eastwards. It is thought that the name derives from an Aboriginal word meaning a man lying on his back with knees raised. The first pastoral run in the area (1838) was named Boninyong. It was occupied by the Learmonth brothers, the first of several families of Scottish descent who settled in the district. Buninyong was near the junction of the roads from Geelong and Melbourne to the Ballarat district (although Ballarat was scarcely known before the gold rushes). A store was erected near the junction in 1841, and a Buninyong post office was opened in 1845. A Presbyterian church was opened in 1847, and its minister opened a school in the following year. A blacksmith and wheelwright’s shop was opened in the 1840s and its proprietor, Thomas Hiscock, was to have a profound effect on the district. Hiscock, hearing of a reward for gold discovery in Victoria, prospected in several gullies around the Buninyong hamlet, finding it on 8 August 1851. A rush took place and, although the Buninyong find was patchy, the miners discovered the rich Ballarat field at Golden Point within a short time. A Hiscock memorial is east of the Buninyong cemetery. 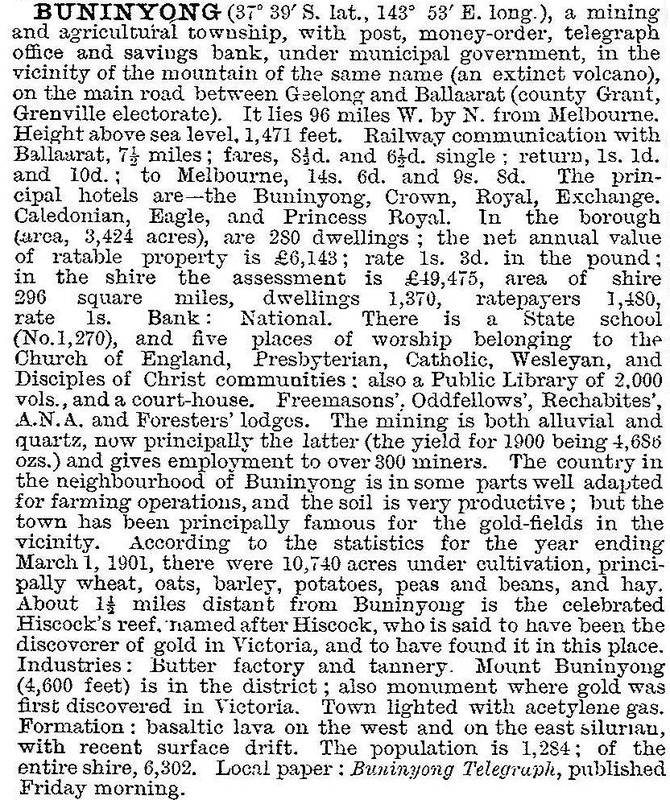 In June 1850, the Buninyong township had been surveyed and land sales occurred in May 1851. Extensive gold mining was delayed until 1857 when the Buninyong Gold Mining Company began operations on 57 hectares of the Learmonth’s Boninyong property. Buninyong, however, had good agricultural land, which formed a basis for long-term settlement. Catholic and Methodist churches were opened in 1853 and 1856. An Anglican school was opened in 1857, and enlarged Catholic and Presbyterian churches were opened in 1858 and 1859. On 15 July 1859, the town was made a municipal borough, a year after a Road District was proclaimed. (The District was the forerunner of Buninyong Shire (1864), which absorbed the borough in 1915.) By the mid-1860s, when Buninyong’s population was about 1500, the township had a main street lined with fine shops and stores, a brewery, a tannery, a flour mill, a mechanics’ institute (1861), six hotels and a petty sessions court. In 1889 a branch railway line was opened from Ballarat to Buninyong. The church schools were replaced by a government school in 1873, with accommodation for 500. After the 1890s mining declined and by the 1930s the population had fallen by nearly a half to about 800 people. Two hotels were enough for the town, and its civic and religious buildings, and municipal, masonic and temperance halls were more numerous. The passenger service on the railway line ended in 1931 and the goods service in 1947. Since the early 1970s Buninyong’s population has grown at each five-year census interval. There is a restored botanic garden (1860), a linear park and sports facility (2006) along Union Jack Creek, a leisure centre, a golf course, a bowls club, several reserves, a swimming pool, three churches, and the former council hall which is on the Victorian Heritage Register. The mechanics’ institute (also on the Register) houses a museum and the historical society. There are several craft and tourist attractions, including an annual festival, a Sunday market and a lookout on Mount Buninyong. To the north-east of the town there is the Union Jack Reserve, noted for old gold workings and Spring wild flowers. Buninyong has the Redline Speedway and also hosts the annual Australian road cycling championships. Buninyong primary school had 596 pupils in 2014.